Side view of an SC50JA (50 kg) bomb. The SC50JA (50 kg) or Spreng Cylindrisch is a German general purpose high explosive (HE) 50 kg bomb. The -Ja mark indicates this bomb comes from the Group I series of SC50 bombs. The SC50JA is a one-piece drawn steel body with a sheet steel tail cone attached by eight screws. The bomb can be suspended in one of two ways, either horizontally or vertically by the use of one eye-bolt lug mounted on the side and another mounted in the nose of the bomb. This version of the SC50JA does not feature a kopfring or an anti-ricochet plate welded to the nose which ensures the bomb detonates on impact instead of excessive penetration of land targets or potentially skipping on water before exploding. The German bomb sets itself aside when compared to similar bombs of other nations as it does not utilise either a nose or tail fuze to arm and detonate itself. Instead, it employs an athwartship fuze pocket which extends the entire width of the bomb with a single weld placed opposite of the fuze pocket opening to secure it in place. The tail cone of the SC50JA featured in War Thunder is a sheet steel cone, and four fins which are unbraced that is they are not supported with either tubular struts or a cylindrical strut ring. A top view of an SC50JA (50 kg) bomb with identification of parts. The SC50JA is the smallest of the SC bombs utilised in the game and as such was found on many different aircraft such as early war fighters and light bombers. Two eye-bolts were outfitted on the bomb, one in the sidewall for horizontal mounting on external aircraft pylons or in some bomb-bays and one eye-bolt was screwed into a threaded socket in the bomb nose allowing for the bomb to be mounted vertically in a bomb-bay. Bombs mounted vertically in a bomb-bay conserved space allowing for more bombs to be installed, and upon being dropped, the bomb fins righted the bomb pointing the nose to towards the ground. 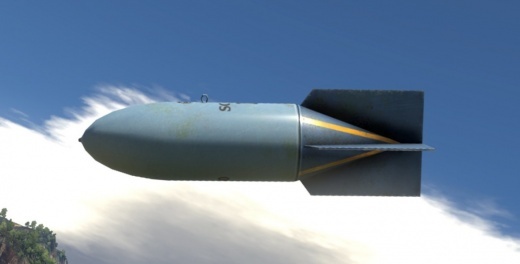 Bombs carried externally on German aircraft are typically painted sky blue to match the underside of the plane and to also make it more difficult to see from the ground when the aircraft is flying. Yellow stripes were painted down the tail cone in between each of the fins. Markings stencilled onto the bomb included bomb grade (Bi, I or II), mark (J, Ja, JB, JC, J/2 or L) and could also include the type of fuze, type of explosive, serial number and other various acceptance information. These bombs if modified for use for water targets, the tail section would be removed, and an anti-ricochet plate would be added to prevent the bomb from skipping over the surface of the water before exploding, usually away from the intended target. Testing showed that bombs without tail fin sections could be dropped from heights of 200 m without any adverse effect or loss of accuracy. 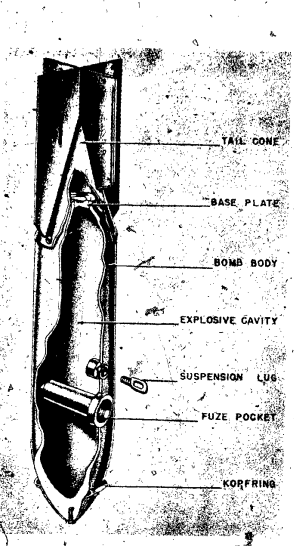 An exploded view of an SC50JA (50 kg) bomb with identification of major parts. The SC50JA utilised Füllpulver Nr. 13 or Fp. 60/40 which was a ratio of 60% Amatol and 40% TNT. Amatol is an explosive compound which is a composition of TNT (Trinitrotoluene C7H5N3O6) and Ammonium Nitrate (N2H4O3). Because of the great explosive velocity and brisance of TNT, one-way stretch resources was to exploit TNT's one drawback. TNT in its pure form when detonated leaves a black smoke residue after it explodes due to the oxygen deficiency in TNT (does not fully explode/burn all components efficiently). Supplementing TNT's need for oxygen, ammonium nitrate is added to the mixture which has an oxygen surplus and overall increases the energy release of a TNT explosion when mixed. When compared to each other, Amatol has a lower explosive velocity and brisance than pure TNT; however because it was cheaper to use Amatol, it became the go-to explosive for general purpose bombs. Unfortunately for the Germans, as the war wore on, sources of Amatol, TNT and other explosives were dwindling, and explosive fillings became more inconsistent rendering many bombs, grenades and bullets to be less effective. The SC50JA (50 kg) is a general purpose HE bomb which was utilised by fighters, attackers and bombers. Due to its size, either two or four were outfitted to a fighter or attacker allowing it to perform low-level precision bombing on AAA or light vehicles. Bombers can carry two to twenty-eight 50 kg bombs and could drop them all in one location bombing a base or could spread them out across the map depending on where the targets of opportunity are. These smaller bombs are most effective when bombing vehicle columns or anti-aircraft artillery sites and can also be utilised to surprise enemy aircraft sitting on an airfield waiting for a reload or repair. This page was last edited on 10 April 2019, at 18:35.